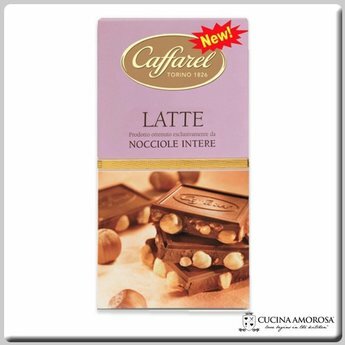 Milk chocolate with whole hazelnuts (20%) and hazelnut (2%), crunch chips (5%) Ingredients: sugar, 22% Piedmont hazelnuts, cocoa butter, whole milk powder, cocoa mass, skimmed milk powder, glucose syrup, inverted sugar syrup, emulsifier: lecithin (soya), vanillin (artificial flavoring). May containg Almond, Walnuts and Pistachio Nuts. Cocoa n the milk chocolate minimum 37%.